I am currently a lecturer at the University of Melbourne, and I also do science outreach for the Australian Centre of Excellence for Mathematical and Statistical Frontiers (ACEMS). I received a PhD in mathematics from the University of Melbourne in 2011, after which I spent three years doing research postdocs in Geneva and Paris. 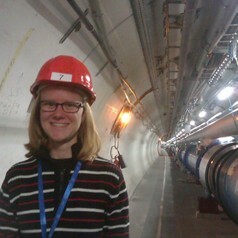 During this time I learnt some basic French, learnt to ski, and had my picture taken at the Large Hadron Collider (the most geekciting day of my life). My field is mathematical physics, specifically statistical mechanics and quantum integrable systems. I also enjoy computer games, playing piano, programming, and birdwatching, in decreasing order of experience.